If you’re unlucky enough to have required precise, timed doses of drugs through an IV in hospital; or if you’ve worked in a lab where controlled amounts of chemicals have needed to be added to an experiment on schedule, you’ll be intimately familiar with syringe pumps. They look like this. And they’re expensive. The one in the picture above, which was the cheapest I could find (in an admittedly very quick and dirty Googling session) costs $750. As with a lot of specialised scientific equipment, that means that it’s difficult for hospitals with restricted incomes, or for labs with a lot of overheads, to get their hands on as many as they need for their work. This applies to cash-strapped university departments and hospitals in your town every bit as much as it applies to organisations in the developing world: equipment like this can be prohibitively costly wherever you are. Joshua Pearce led a team of graduates and undergraduates from Michigan Tech‘s Open Sustainability Technology Lab in a project that intended to do something about that. 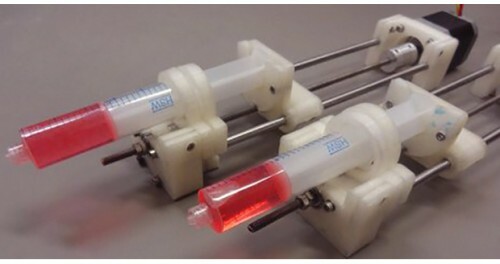 They have created an open-source, 3D-printed syringe pump that can be made for a fraction of the cost of existing pumps, using an off-the-shelf motor and bearings, which is driven by a Raspberry Pi. The whole system comes in at about $50: that’s a fifteenth the price of the pump in the picture above, and it performs exactly the same task, in exactly the same way. The plastic parts are made with a 3D printer; a Raspberry Pi acts as a control and calibration unit. Cost can be a devastating barrier to entry to the sciences, and for basic health needs like pharmaceuticals delivery. One of the things we were trying to address when we created the Pi was the high cost of computing. We’re strong believers in democratising access to technology, and this project’s a perfect example of how to do that. This will take over scientific experiments in *very* short order. However, it isn’t going to turn up in your local hospital anytime soon because of the bureaucratic overhead of certifying anything for medical use … but that’s a political or social problem, not a technical one. Yup – that was our feeling as well. I would not be surprised to see it appearing in hospitals in parts of the world where pragmatism and a lack of funds have a louder voice than regulatory bureaucrats, though. Testing whether a life-or-death device actually, definitely does what it says, every time, without fail, does not fall into most people’s definition of “bureaucracy” though. The ideal fix is to have properly tested equipment throughout the world. Having improperly tested equipment is often better than having none at all, but that still doesn’t mean that such testing is “bureaucracy”. I’m sure that’s also what you meant, though, because you’re obviously lovely. Although I haven’t tested that. Dragged from the recesses of my brain; here is a link to Hospice workers in Uganda preparing Liquid morphine using kitchen sink technology. A 3d Pi-powered pump would be a perfect affordable tool for their work. Even if they had to produce a manual driver pump with a Casio stopwatch sellotaped to it. (Turn one click every beep of the alarm) It could offer so much relief to people who would otherwise die in agony. We should forward this to the Health Minister! When I worked in pharmaceuticals I was frequently amazed by the size of the lab-tax levied by equipment manufacturers. It’s the same in other industries, but big pharma at the time could simply add the costs to the next blockbuster and carry on, so we got to see quite a few precision-engineered pricetags. My lab used syringe pumps, but not for anything especially critical, so I don’t know how that kind of cost would have been justified even then. There’s already a 3d printed, Pi-powered Raman Spectrometer – check out http://hackaday.io/project/1279. One of humanity’s biggest failures is health care. So many don’t have access to it. Undoubtedly one of the reason’s is big pharma and the cost of proprietary medical equipment. will help to start the very late adoption of open source and IT innovation into the medical field. So many IT people are probably still too young to have suffered health problems and thus they probably haven’t seen the need to apply their minds to medical tech. Hopefully this will change soon in conjunction with great little projects like the Raspi and 3D printing. I can see this being used in labs, but not so much in medical applications. 1. Would you test your very life to this device? 2. Who gets sued if it fails to perform as expected? It’s not just the physical construction (that appears to be sound enough), but you also have to trust the programming. If there is a bug or an unclear interface in the code, it wouldn’t be the first time a programmer managed to kill people. you also have to trust the programming. If there is a bug or an unclear interface in the code, it wouldn’t be the first time a programmer managed to kill people. As opposed to a commercial item where you have no idea what code it runs (I’m sure it runs some these days), and what good practice may or may not have been followed in it’s development. I work with commercial hardware/software products (in another, less directly life-threatening, field) and the quality of items in the market, and the problems they then cause, never cease to depress me. I’d much prefer to know what was in a black (/white/red) box! Looks like a useful piece of lab / experimental equipment, but as already pointed out, not a drug infusion device. Creating and selling a medical device, and validating it for applications in healthcare is a non-trivial and non-cheap process. The MHRA is the relevant authority in the UK who governs the application of the relevant legislation. Also, using it for development of new pharmaceuticals would be a potential problem due to the requirements of Good Laboratory Practice that would generally shy away from using a non-validated, non-CE marked device. It’s frustrating to have to go through the expense of getting equipment certified, but the legislation is there to protect the patients and potential patients who might benefit. One of the main reasons that pharmaceuticals are so expensive are the overheads inherent in the systems that are there to govern their development. Western governments don’t have a problem using desperate people in developing countries as guineapigs for untested Ebola drugs, so it feels kind of hipocritical to get precious about cheap 3d printed syringe pumps on their behalf. As I understand it, GLP normally includes the requirement to test the performance of all equipment before (and, often, after) use – after all, even the best instrument will fail at some point. Of course, the company might prefer to trust a brand with a proven track record, but once a device has been purchased it should always be validated in-house for all intended uses. I’ve no idea how that applies to hospital situations though. Yes, proof of concept true, but honestly which one would you want used on your or your loved ones? Come on now, honestly. First your = you. Oops! Can’t seem to find a way to edit it from my iPad. Made by a 3D printer and possible usable as part of a 3D printer. Call it the Furrey. Then it would be a Furrey with a syringe on top! Grendel Briarton did that joke decades ago with his first Ferdinand Feghoot short-short. I absolutely agree with the skeptics. Maybe the big brand version costs $750, but there need to be guarantees about the reliability. There are people’s lives at stake! I don’t even see a monitoring mechanism, eg. which monitors whether the syringe moves or not, moves more or less? Etc. I once helped design infusion pumps (look up the Medfusion 4000). The device pictured here is a syringe pump and ONLY a syringe pump. An enormous amount of software, sensors, and safety interlocks have to be added before you could attach this to a human being. Without those extra elements it would be way to easy for the user of this pump to make a mistake and cause an overdose (often lethal), an underdose (very problematic for pain management and anticlotting), or use of the wrong medication. Needless to say, the misuse of infusion pumps and/or design flaws have led to a number of hospital deaths. This pump might be good for lab experiments but it is by no means comparable to a medical device which follows standards and underwent thorough testing. 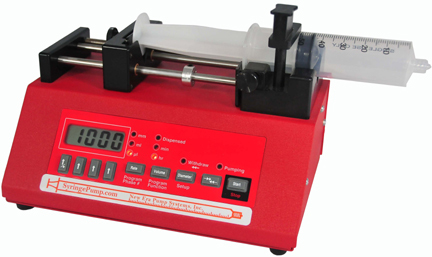 Disclaimer – I write and sell software to interface with several makes and models of syringe pumps – especially the red one pictured above a New Era NE-1000. In fact New Era recommend my software for use with their pumps and link to it from their webpages. New Era also sell my software from their website. First a picture of the rear of that pump would show CAUTION NOT FOR CLINICAL USE ON HUMANS. I applaud the 3d printed syringe pump and might even assemble one here to play with in a quiet moment. I have looked at the open source code that’s available for it as well. I have about 12 commercial pumps here so I am familiar with the construction quality as well as the software in the pumps. Heck I regulary exchange technical emails with the man who writes the code in the pictured pump. I also have built a 3d printer and played with that too. We are not comparing apples with apples here. There’s nothing wrong with the 3d pump. It is what it is and that’s ok. But it is not a replacement for a commerial unit – not at all. It’s like saying a model aircraft is the same as a jumbo jet – they both fly… but. I can see that some of my customers could use the 3d printed pump but I can also see that most of them could not. The reasons are manifold but principally repeatability, resolution, reliability, and functionality. The 3d pump falls way short of a commercial unit in all of these areas. There are easily observable drive train features in all commercial pumps that the 3d pump simply doesnt have. Then a commercial pump’s internal software (not my software) has so many extra features that arent in the open source software. I’m sure some of those software features will come in time. In addition the 3d pump will require a considerable technical skill set for the end user to build, program the PI, calibrate and tune it for their intended use. All very possible but it takes time and can frustrate. At some point results become worth $. I see many brilliant minds from many fields collide with the commercial units – not every one can turn their hands to these other technical skills, some are repulsed by tech – they are simply specialists in their fields and can struggle with tech details. It would be nice to see the aggressive ‘how can they charge that much for a commercial pump when we can print this cheap thing talk’ stop. It does make the speakers sound like they don’t know what they are talking about. Again – I applaud the project and I can see some applications for this device, but it wont replace too many commercial pumps. Indeed I think it will probably send business to the commercial pumps as it lowers an entry barrier and will bring new pump users who might find that it was good to get started but then grow out of it. Back in 1982 as a chemistry undergrad, I programmed a Commodore PET to drive a stepper motor actuated syringe and read back from an iee488 connected pH meter in order to automate simple titrations. So much more fun, than smells and bangs, that I jumped ship and trained as an electronics engineer! This is truly incredible. I come from a Medical Background and I could definitely see a use-case for this AT LEAST in Developing countries, I am crossing my fingers to make sure that projects like this are heard about by the right stakeholders in Healthcare.